Shutts attorneys present Kids in Distress with $5,000.00 donation. 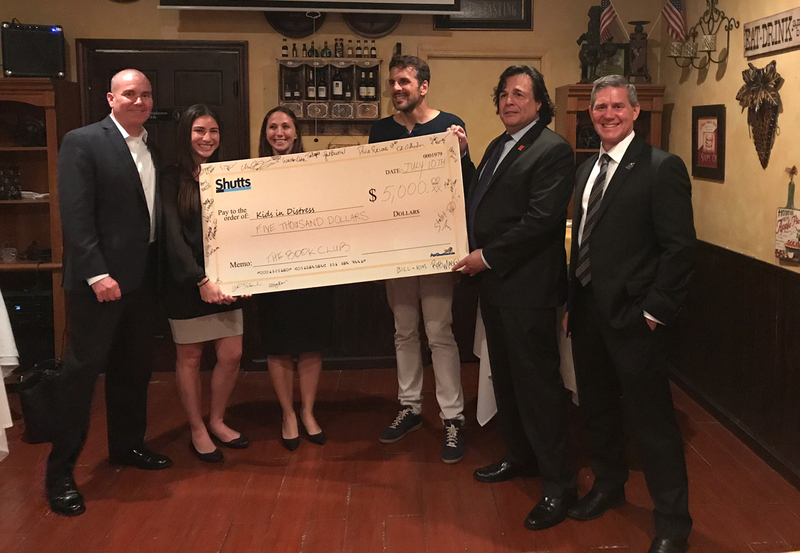 On Monday, July 10, Brendan Aloysius Barry’s “Book Club” along with several Shutts attorneys raised approximately $5,000 for local organization Kids in Distress. Funds collected will help send 85 children to summer camp in Fort Lauderdale. Kids In Distress of Broward and Palm Beach counties (KID) is a licensed nationally accredited agency working for the prevention of child abuse, preservation of the family, and the treatment of abused and neglected children. The organization serves more than 11,000 at-risk children and their families each year through a continuum of services. The event was held at Café Vico in Fort Lauderdale. The hosts were Book Club founders Maxine Gomez, Dry Tech 24/7; Carlos Castresana, Wells Fargo Insurance Services; and Brendan Barry. Guests included Michelle Vehemente, City National Bank; Rob Kramer, IGFA; John Brown, Wells Fargo; Fred Perry, Learn to Fly Centers; Gail Bulfin, Greater Fort Lauderdale Alliance; Jim Perez, UBS; Justin Stone, CroweHorwath; Mark Binko, National Jets; and Shutts lawyers Deedee Bitran, Ed O’Sheehan, Amy Wessel, Robin King and Andrew Schwartz. Also present were Kids in Distress President and CEO Mark Dhooge and their Director of Major Gifts & Planned Giving Letty Vendrell. Brendan Aloysius Barry is a partner in the Ft. Lauderdale office of Shutts & Bowen LLP, where he is a member of the Real Estate Practice Group. A Martindale-Hubbell AV® rated attorney, Brendan has been recognized by Florida Super Lawyers in Mergers and Acquisitions and is Florida Bar Board Certified in Real Estate. Brendan is a member of the Audit Committee of the Broward County School Board, a member of the Boys and Girls Club of Broward County, and a member of the Off-Road Vehicle Advisory Committee of the Big Cypress National Preserve.